I tidied my writing desk yesterday because we had a little cocktail party. I didn't mean to arrange it as such, but the piles (I always have piles!) 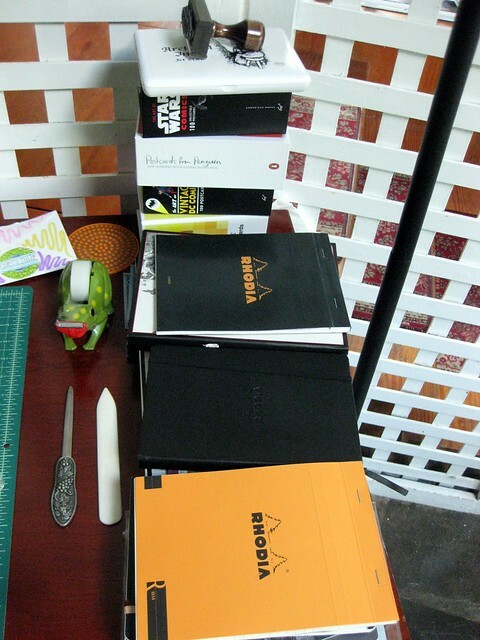 ended up looking like an advertisement for Rhodia, with a secondary tier for Chronicle Books boxed postcards. They do stack tidily... On the top of these piles you can see my Rhodia Webnotebook, a Rhodia No.16 lined tablet (black cover), and the new R by Rhodia soft-touch No.16 tablet (orange cover). Lurking underneath there somewhere is a Rhodia dotpad, too. 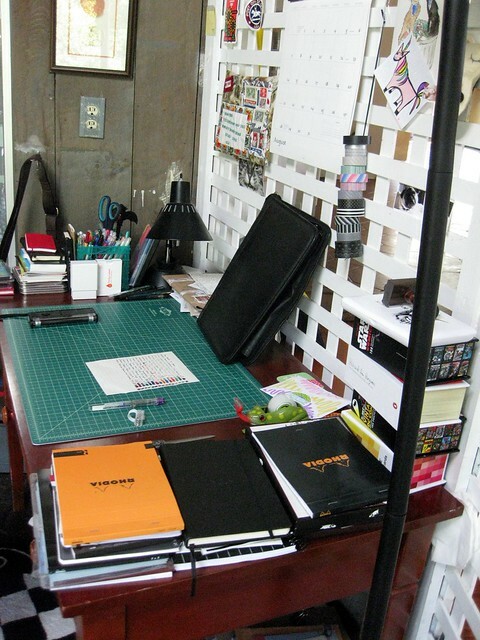 I always love seeing photos of people's writing spaces, so here's what mine looks like right now (or what it looked like yesterday when I was doing an ink test, which will be showing up on this blog shortly). I am particularly pleased with how I've learned how to use the room's built-in lattice, which used to be an annoyance, as an advantage, by hanging things from it. My latest storage idea was to hang my washi tapes from a ribbon (with a paper clip securing them underneath) - keeps them right at hand, but off the surface of the desk. If you click on the photo above, that will take you to the photo on Flickr, which is covered with a lot of notes showing what things are. Sometimes I just love Flickr notes so very much.